The whirlwind pace of Fashion Week shows and parties is de rigueur for buzz-happy fashion editors and groupies, no matter how up to speed they profess to be. So it’s rare when a hot young designer sends them into a tizzy the way that London-based Ada Zanditon recently did. 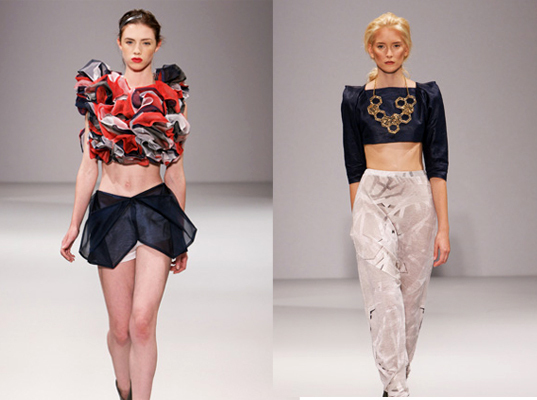 Her Spring/Summer 2010 collection (“Colony”), presented at London Fashion Week/Vauxhall Fashion Scout’s One’s to Watch Show, is not only an example of textile biomimicry at its best, but also a signal that we might finally be ready for true ethical and environmental storytelling in fashion design. I first became aware of Zanditon in 2008 at The Ethical Fashion Show Paris. Later, I interviewed her about her standout Graduate Runway Presentation at the London College of Fashion, as well as her Spring/Summer 2009 Collection. Since then, we have stayed in regular contact, and we even met up in NYC last spring to discuss the trials and tribulations of creating wearable, sustainable couture. If anyone understands what powerful organic design is, it’s Ada Zanditon. Zanditon is incredibly well-read, can cut a mean piece of cloth (she interned with British designer Gareth Pugh), and can also pull ideas for her designs from the most disparate and poetic sources. If anyone understands what powerful organic design is, it’s Ada Zanditon. Instead of her signature three-dimensional sculptural statements (think uniform-like padded shoulders and voluminous hourglass dresses), Zanditon opted for a softer tack with “Colony.” Inspired by A World Without Bees by Alison Benjamin and Brian McCallum, Zanditon’s latest collection translates the hexagonal cells of a honeycomb into high style. The natural world is a blueprint for great, timeless design. Royal reds, blues, and soft grays further distill the designer’s message that the natural world is the blueprint for great, timeless design. Ruched, pleated dresses, architectural skirts, and midriff-baring tops—topped off by dazzling accessories—all created a neat and smart presentation with a message. As I watch these pieces come down the runway, one thing is clear: Ethical fashion is on its way, and the vital stories to be told are only just unfolding. Ada has my vote - Fantastic clothes, an excellent designer and a credit to the world of ethical design! The whirlwind pace of Fashion Week shows and parties is de rigueur for buzz-happy fashion editors and groupies, no matter how up to speed they profess to be. So it's rare when a hot young designer sends them into a tizzy the way that London-based Ada Zanditon recently did. 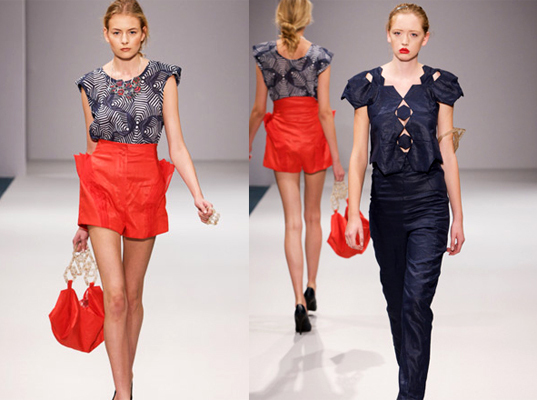 Her Spring/Summer 2010 collection ("Colony"), presented at London Fashion Week/Vauxhall Fashion Scout�s One�s to Watch Show, is not only an example of textile biomimicry at its best, but also a signal that we might finally be ready for true ethical and environmental storytelling in fashion design.